Finally I`m complete this cool map. 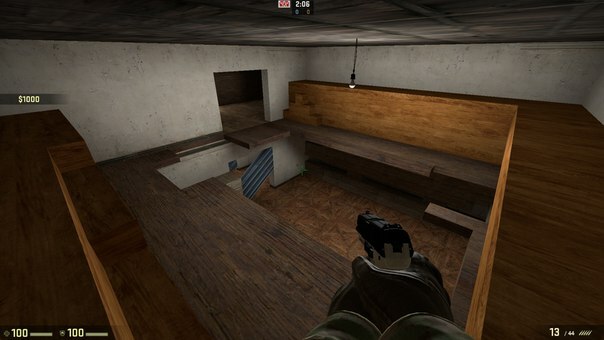 This is remake of famous map from CS 1.6 - zombie mod, which also known as "first official zm map in cs 1.6". This map looks like small house with second floor and long way to big underground with tomb, secret room etc. Zombies must destroy doors (500 hp) and kill all humans, but humans can hide themselves somewhere at map and be silent til round ends. original map made by Navy (see his icq in zm_toxic_house2_max.txt file). map in cs2d made by Fapicon_rus (see my icq zm_toxic_house2_max.txt file). all rights reserved (I`m speaking with Navy and he said that I can make remake :P). All textures from original map. Secret trigger which gives you wrenches. Realistic lights at map (like in original version). Map use only unstandart textures and no one other unstandart file. Maps good for Zombie Plague, Biohazard, Zombie apocalypse and other infection scripts. Hi all, after passing few months I`m update this map. Now I fix all bugs which I find. If you`ll find MOAR bugs - PM me. @ Rax: It will work just fine.But some walls are bit mess using the 3d option. Best! Best! Best in 1.6, best in CS2D! Best zm map on the site, like it! It's so cool! Nice map!